Whether you own a residential property or a business property, you may have a need for a tree surgeon in Leeds at some point in the future. At Bardsey Tree Services we offer a wealth of experience in tree surgery, after all we have been in the tree business for over 20 years. Throughout this time have seen some very dangerous practices carried out by tree competitors; such as inadequate safety equipment being used or safety practices being low on the agenda. Whilst carrying out tree felling in particular this should be of paramount importance. We have a team of tree climbers who are all very experienced, fully trained with their safety and the safety of others at the forefront of all that they do. We have public liability insurance up to £10’000’000 and our staff are City & Guilds NPTC Qualified. 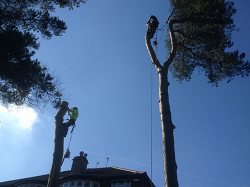 So if you are looking for a Tree Surgeon in Leeds, Wetherby or Harrogate be assured when you choose Bardsey Tree Services you have made a safe choice!